From a small electrical systems company to a fully Sicilian multinational corporation. It was the farsightedness of Salvo Raffa, enterpreneur born in 1949, to shape a knocking opportunity into a successful business tale. In less than 30 years, a small electrical systems company becomes a fully Sicilian multinational corporation. A decade-long partnership with Danilo Consoli consolidated with the foundation of Meridionale Impianti, and developed thanks to the services offered to the multinational STMicroelectronics. It began accumulating experience and knowledge in the fields of specialised technological plants, gas, chemicals and general ultrapure fluids management systems, automation and control systems and global maintenance systems. Meridionale Impianti started the overhaul of the industral team and became an SPA, with settlements in Italy, Singapore, USA, Morocco and France. Thanks to its leader entepreneurial skills and to a highly motivated manager, the activities range expands to the fields of microelectronics, chemicals, pharmaceutical, nuclear, aeronautical and civil. The company undertook the path of diversification and launched a company specialized in designing and building Clean Rooms for the pharmaceutical sector, based in Rousset, France. The Power Division is born in Caponago, operating in the fields of Transmission and Electrical Distribution for building HV/MV Electrical Substations. It takes its first steps in Morocco, and quickly raises to become one of the main suppliers for the ONE, the national electrical institution. Joint venture with ONDEO Industrial Solutions (Suez Lyonnes des Eaux group) for the production, setup and management of waste waters (Waste Water Treatment) systems for STMicroelectronics. Agreement with Praxair for the management of special gases storage for the STMicroelectronics in Catania. Agreement with Elsag for the provision of FMCS (facility monitoring and control) systems and access control systems for all the STMicroelectronics establishments. Joint venture with Ondeo IS for the implementation of a Total Water Management service in STMicroelectronics establishment in Rousset. The company registered office is moved to Caponago (Milan). Agreement with the CNR for the development of a preliminary study for the production of H2 from the retrieval of exhausted solvents. Partnership with Air Liquide in Soxal Singapore for the provision of Hook Up and FIT Up systems for STMicroelectronics. Partnership with BP Solar (Spain) for the in-place building of photovoltaic plants. 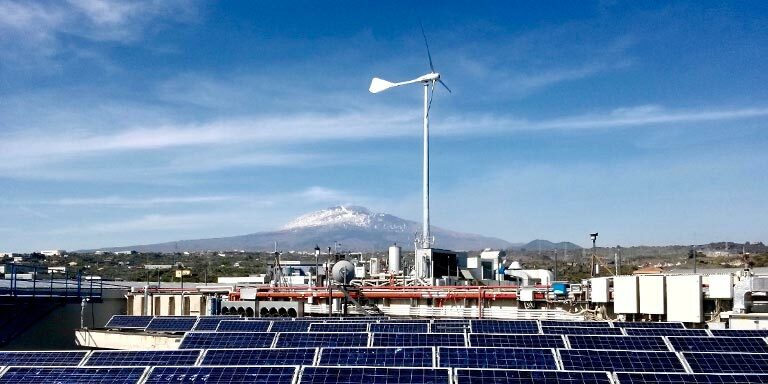 The MI Solar division is born, operating in the photovoltaic sector and creating a productive line of hi-efficiency photovoltaic modules in the field office of Piano Tavola industrial area, in Belpasso (Catania). As of today, it claims an installation for the construction of photovoltaic panels, and a Clean Room for assembling UHP systems. Partnership with Credito Siciliano for the provision of fundings for building photovoltaic plants across the Sicily. il 24 Settembre 2013 ha ottenuto la certificazione del sistema di gestione dei servizi di efficienza energetica (ESCO) in accordo alla UNI CEI 11352:2010, ed è quindi certificata per operare come una ESCO a tutti gli effetti.